A good option for travelers who value service, atmosphere, and an accessible price over top-of-the-range facilities, this welcoming guest house sits atop the highest of Lisbon's seven hills--and the views are extraordinary. Located in Graça, one of Lisbon's less touristy neighborhoods, it is still close to all the sightseeing, shopping, and nightlife action, and there are lots of small 'Mom and Pop' places to eat in the surrounding streets. The rooftop bar, with terrace, has gorgeous views over the red roofs of this scenic city and down to the shimmering River Tagus, and is also the setting for a decent--if rather unspectacular--breakfast spread. YOU SHOULD KNOW Steep climbs mean this is not a good choice for guests with mobility issues, but the famous 28 tram runs close by. Let the tram make the climb for you! Rooms aren't the most modern or stylish in the city, but they are clean, comfortable, well-equipped, and most have views--those on the upper floors naturally have the most impressive vistas. Large windows make the most of the hilltop location, and many of the rooms and suites have balconies or large terraces. Rooms have free Wi-Fi, air conditioning, and cable TV. YOU SHOULD KNOW It's in a busy neighborhood, so there is some street noise, but rarely enough to prevent a good night's sleep. Bathrooms are clean and functional, with tubs and showers. Traditional Portuguese tile work adds a splendid dash of color. The exterior is a unprepossessing and the lobby a little dated, but the reception care friendly and helpful, and there are some comfy armchairs and chaise longues dotted around the compact lobby area. Think cozy and welcoming, rather than flashy. The rooftop bar is the setting for decent buffet breakfasts, and the gorgeous views are particularly dramatic during the summer when the terrace really comes into its own. After breakfast, the room functions as a bar and is famous locally as an unpretentious spot to sip a drink and admire some of the very best views in the city (and in a city with as many hilltop viewing points and roof bars as Lisbon, that's saying something!). Open to non-guests, the bar serves light meals and some lovely small plates for sharing--the local cheeses are a good case in point. The rooftop bar is a popular place for locals to come and admire the view as they sip a perfectly mixed cocktail, and there's a good, reasonably-priced, variety of Portuguese wines. Come here at sunset to watch the sky turn pink, then golden, as you sip a drink. Guests here should be prepared for some steep hills--wear sensible shoes as the pavements are slippery. Climbs can be minimized by taking the famous 28 tram, which runs nearby (staff will advise on the best place to board). Taxis and Ubers are easily available, and inexpensive. 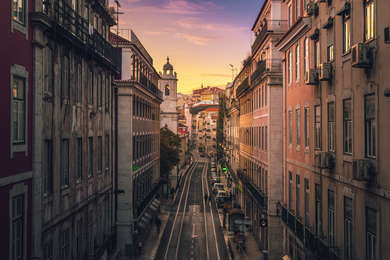 Martim Moniz metro station, which has connections to the airport as well as to the rest of Lisbon, is a 10-minute walk away--due to the hilltop location, the best way to get here from the airport (under five miles away) is to take a cab. The location is ideal for visitors who like to experience the true flavor of a city, rather than its touristy side. There are lots of small, affordable places to eat nearby. One such place is Zé da Mouraria (10-minute walk), a traditional eatery serving colossal portions of delicious local dishes, including some excellent seafood. Mouraria, a historic neighborhood close to the hotel, is a great place to enjoy live fado music as you dine--try Maria da Mouraria (10-minute walk) for fine singing and good food. The hotel is within walking distance of lots of lively bars--head down to Martim Moniz for lively weekend street food markets and pop up bars, and hipster-pleasing rooftop cocktails at Topo (10-minute walk). A favorite Lisbon pastime is sipping a drink at an esplanade bar or street kiosk, so head to Esplanada do Largo da Graca for drinks and light bites with lovely panoramic views. In summer, Sangria is the drink to order, in winter opt for vinho quente--the hot, spiced version. This is an unpretentious, affordable hotel with wonderfully friendly staff and outstanding views due to its hilltop location. The terraces are spacious and offer fantastic panoramas, and the rooftop bar is a great place for evening drinks. The neighborhood is far enough off the tourist track to feel authentic, but close to big ticket attractions and nightlife districts.